Product prices and availability are accurate as of 2019-04-19 07:12:29 UTC and are subject to change. Any price and availability information displayed on http://www.amazon.com/ at the time of purchase will apply to the purchase of this product. Like fine wine, the Sorbus® Bamboo Countertop rack gets better with time! Created with timeless and breathtaking bamboo, this foldable countertop wine rack is a classic way to store, organize, and showcase your wine collection. It's functional and essential for any flat surface area in the kitchen, dining room, or bar and coordinates well with existing decor. Entertain family and friends with classic style. Throw a wine and cheese party for your favorite social circle, or create a mini home bar experience while watching major sporting events. For a stunning display, add multiple racks side-by-side on shelves to create a mini wine cellar in your home, business, or event. This freestanding bamboo rack also adapts to hold sparkling cider, specialized olive oils, balsamic vinegars, and even kitchen supplies! With a little resourcefulness, this could easy become a shelf for displaying towels, stationery, toiletries, make-up, and more! The compact size and functional design is great for small spaces and easy storage. 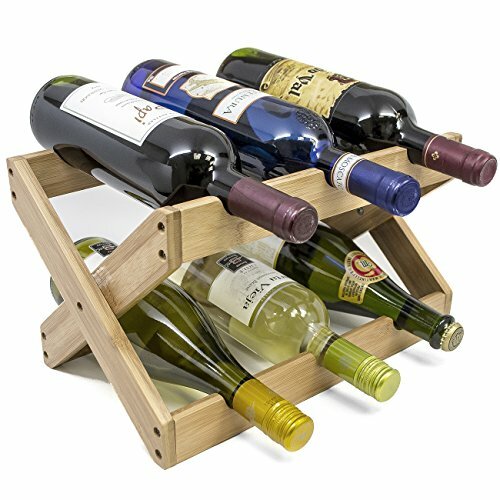 Featuring a 2-tiered wood shelf construction, this compact bamboo wine holder is designed to hold up to 6 bottles of your finest wine selections. It also creates a functional and eye-catching addition to any studio apartment or small living space with limited storage. The sturdy construction and clever design makes it difficult for bottles to wobble, tilt, or fall out. Easily folds and tucks inside your kitchen cupboards and cabinets. Measures approximately 8" L x 3.75" W x 8" H, when opened and 14" L x 11" W x 8" 2.75 " H, when folded close. Ideal for a housewarming or bridal shower gift, just pair with the recipient's favorite bottle of wine!